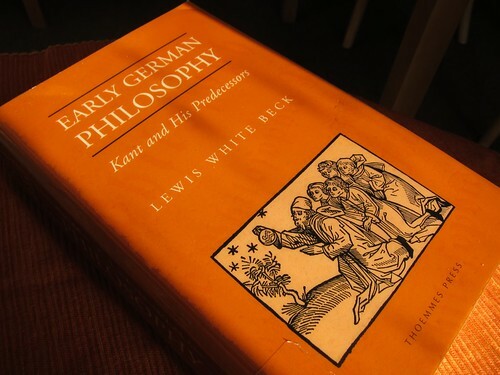 Instead Beck argues that a “national history of philosophy” can be “parasitic” upon the study of “interests and conflicts in politics, society, religion, literature and art” during a particular historical period. Throughout the book he alludes to circumstances and “complexes of powers and problems” that are relevant to the development of philosophical thought in Germany. A major theme is the way in which the development of the university system shaped philosophy. Beck argues that we should not underestimate the impact of the fact that many important philosophers were attached to universities. Philosophical movements sprang up around particular institutions (“Marburg neo-Kantianism”, “Jena Romanticism”, “Berlin idealism”). Universities were state institutions, which meant that political criticism was either absent or highly disguised. He contends that the nature of the university system meant that doctrines would often quickly become dogmas which gave rise to antithetical reactions – “pantheisms, humanisms, vitalisms, mysticisms”. Thus begins his project, which is epic in scope. The following is an indicative (but certainly not exhaustive) list of figures whom we encounter throughout the course of the book: Albertus Magnus, Meister Eckhart, Nicholas of Cusa, Johannes Althusius, Paracelsus, Philipp Melanchthon, Jakob Böhme, Johann Jakob Spener, Joachim Jungius, Joseph Clauberg, Ehrenfried Walther von Tschirnhaus, Erhard Weigel, Christian Thomasius, Samuel von Pufendorf, Christian Wolff, Johann Christoph Gottsched, Johann Jakob Bodmer, Johann Jakob Breitinger, Alexander Gottlieb Baumgarten, Georg Friedrich Meier, Gotthold Ephraim Lessing, Moses Mendelssohn, Johann Georg Hamann, Friedrich Heinrich Jacobi, Johann Gottfried Herder, Christian August Crusius, Johann Heinrich Lambert, and Johann Nicholas Tetens. 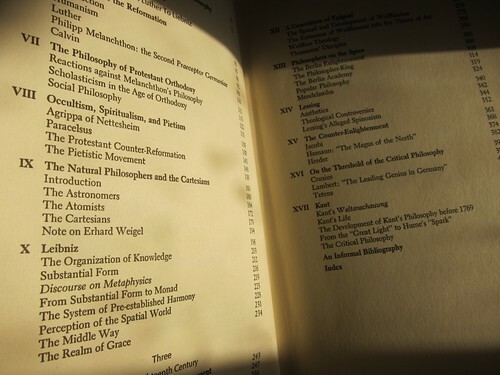 Each chapter gives an overview of thinkers, ideas and schools of thought from a given period in German philosophy or clustered around a certain theme, with the exception of full chapters on Nicholas of Cusa, Leibniz, Lessing and Kant, whom receive more extensive treatment. Beck highlights the theological roots of many disputes, debates, and dogmas. Proponents of the Aufklärer were on the whole significantly less secular or anticlerical than their French or English counterparts. Romantic and proto-Romantic critics of the Enlightenment were deeply influenced by various forms of Pietism and mysticism. From metaphors and assumptions to moves and arguments, German philosophy is saturated in god talk. As well as tracing the contours of tendencies and tributaries in the German philosophical tradition, there are some fantastic morsels of (mostly completely unnecessary) detail about its figures and episodes. Albertus Magnus had a vision in which “the devil (uncharacteristically, to be sure) is said to have … tried unsuccessfully to frighten him from the study of Aristotle” (p. 31). Thomasius was the “first professor to wear a sword while lecturing” (p. 249). While defending “Wolff’s restricted version of the theory of pre-established harmony” Gottsched “was so thoroughly defeated in the subsequent disputation that he burst into tears” (p. 279). Frederick the Great liked to forget he was king, but “wanted his companions who were poets and philosophes to remember it always” (p. 309). Frederick’s father Friedrich Wilhelm asked the Berlin Academy to “make the path of the sun around the earth a circle and not a square” and to “make sure there were as many good days and as few bad days as possible in the calendar” (p. 314). To mention just a few of the possibly less familiar ideas that the book is brimming with: the metaphysics of light and emanation-theory of the Neoplatonists (pp. 39, 47), Nicholas of Cusa’s microcosmic conception of humankind and geometrical explorations of the infinite (pp. 57, 65), Paracelsus’s doctrine of ‘signatures’ and the idea that creation emerges from matter like a sculpture from a block (pp. 143-144), Sebastian Franck’s notion that the bird is sung and flown by God (p. 149), Valentin Weigel’s conception of the mind as a pool of water (p. 150), Joachim Jungius’s belief that nature writes with an atomic alphabet rather than in pictures (p. 177), Erhard Weigel’s mechanical representation of moral concepts (p.194), Leibniz’s suggestion that there is a world of creatures in every drop of water (p. 244), and Thomasius’s contention that “light and air are a spiritual being” (p. 252). Early German Philosophy is a work of scholarship the likes of which are now lamentably rare. While it can be slow going and the terrain is often tough, its philosophical acumen and historical erudition conspire to leave its readers with an dizzying panoptic impression of the contingent historical development of the vast cathedral that is the subject of the book. This entry was posted in hamann, herder, history, humanities, intellectualhistory, philosophy. Bookmark the permalink. Comments are closed, but you can leave a trackback: Trackback URL.